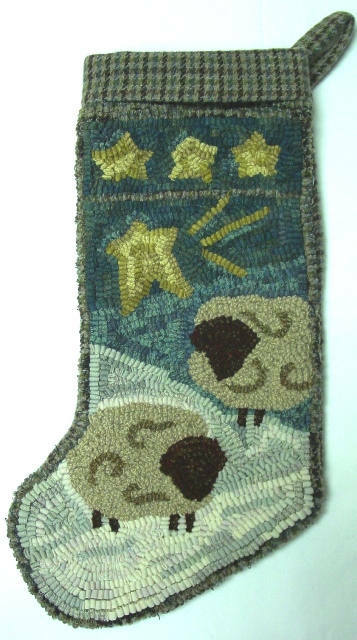 "Two Sheep Stocking" PATTERN measures approximately 8" across the top, 18" long and 12" across the foot. 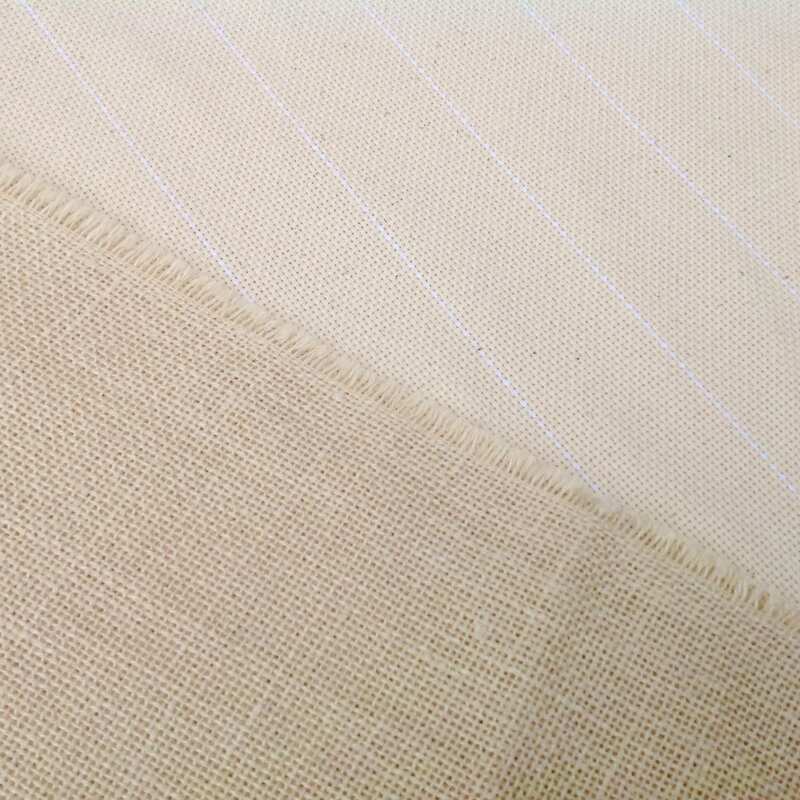 Order on your choice of either cotton monks cloth or primitive linen (see FAQ for more info on foundation fabric). A 4" x 6" color photo is included with the pattern. The pattern does not come with instructions on how to hook or how to finish. I hooked this pattern using a #8 (1/4" wide) strips. 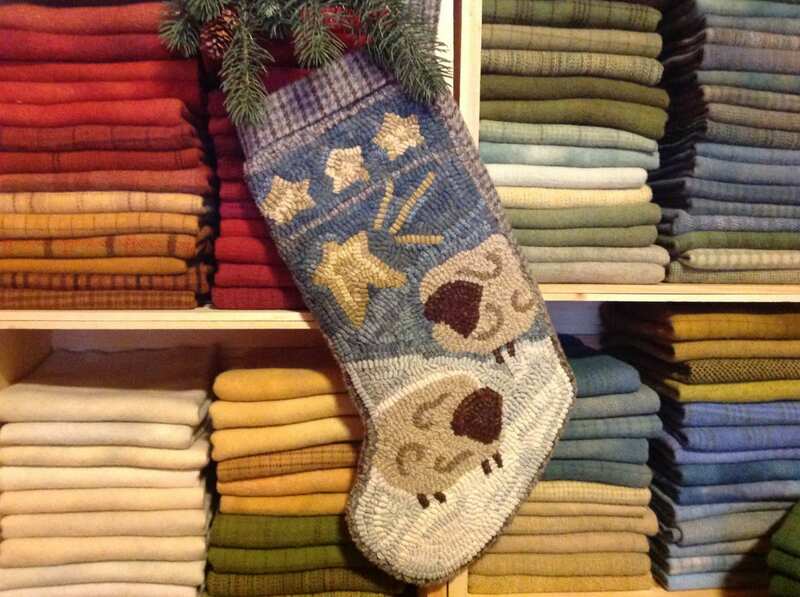 This stocking pattern is a good way to use up all the smaller wool pieces that you have in your stash. Take a bundle of creams and mix them in the sheep. A mix of whites and grays for the snow, a bunch of blues for the background and a few strips of gold for the star and you're set. I hand draw the design on the foundation fabric with all straight lines on the straight of grain. There are 4" inch allowances on all sides making it large enough to fit on most lap frames and in a 14" hoop. The outside raw edges have been serged to prevent raveling while hooking. © Mary Johnson. All patterns at Designs In Wool are copyrighted by Mary Johnson, the designer. Your purchase of this pattern gives you rights to use this pattern one time or to give as a gift. You cannot make new copies, redraw, reproduce in any manner on your own or give this design to others. Thank you for respecting my small business by keeping copyright laws. Thanks for visiting and feel free to contact me if you have questions. Adorable pattern, just hope I can hook it half as cute as the sample picture.